At first, I just couldn’t see it! What was he pointing at??? I saw this beautiful spider’s web!!!!!! Which is soooo attractive to me! Don’t get caught in a web of the devil’s lies!! But it’s a death trap!! It’s hard to see his tricks! The enemy has for you! And embrace God’s Plan for your life!! I love this promise of God!!! Very well written! Thanks for sharing this! Thanks so much…I particularly pray for all the kids, teens, and young adults I work with! Even mature Christians have trouble recognizing satan’s lies…so much more so for young or new Christians! I’ve seen those webs like this in Hawaii…and some of the weirdest spiders to go with them. Oh no! I didn’t actually see the spider, do you think it was big?!?! 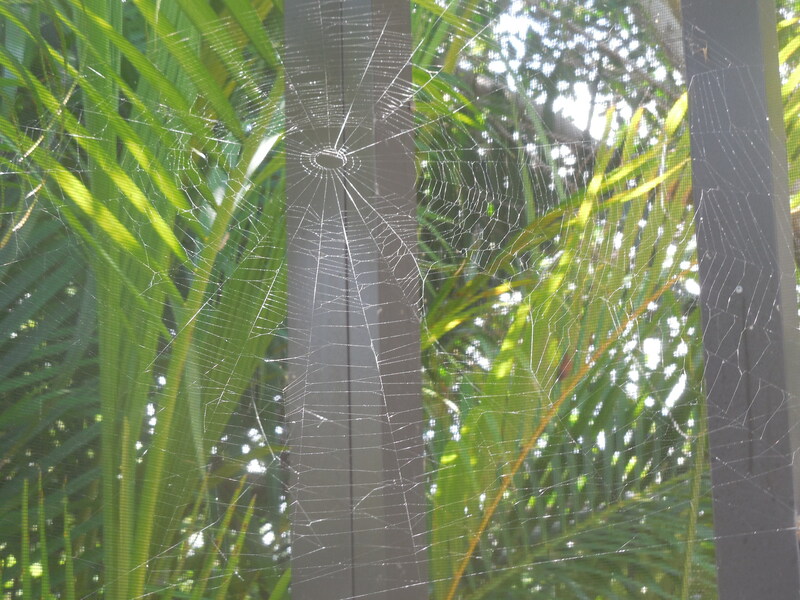 The web was inside our lanai…I hope the spider that made it wasn’t big…and isn’t still inside…because our Crazy Siberian sometimes tries to eat bugs!! The one I saw was about the size of a half-dollar – legs and all, lime green and bright yellow with black eyes. Being a Hawaiian spider, he had to be extra gorgeous…never thought I’d say that about a spider. That was better than the gecko who ran around on the ceiling of our condo, leaving little “gifts” on the kitchen counter beneath him! What a beautiful spider!! Nope, didn’t see that one here, for sure!! Hawaii is soooo beautiful a place…my husband wants to go back, since our son wasn’t born yet when we went a longtime ago! Sometimes I think those lime green, fuzzy caterpillars are gorgeous too…when really I tend to think most bugs are just Yucky!! Ha! Here in FL, lizards are everywhere…and it’s a very buggy season here right now! I don’t like cockroaches (or Palmetto Bugs as the Floridians say! Ha!) at all!!!!!! Eew! They tend to be huge closer to the equator. Ours are about 1″ long. The ones in Hawaii were about 4-5″! My husband was a cop in East Orange, NJ…and they used to have a contest called “Roach of the Day!” They would put them on their bulletin board to see who caught the largest one! Cops think that stuff is funny! !